The ancient Avalon Hill Panzerblitz was not the first wargame I encountered in my pre-teen days, but it probably had the most profound effect on my future. I would later design Panzer Grenadier as its replacement for the old Avalon Hill Game Company, today a foundation of Avalanche Press. It featured a small guidebook, describing the units represented by the pieces and how they were organized. I read that little booklet over and over again, realizing years later that a game based on historical events could be made far more interesting, far more fun, with those events fully described in the context of the game and its play. That last is something I really want to emphasize even more in our game line: not just telling the history, but showing it through the games themselves. We’ve taken some great steps in that direction with the story-arc format in recent Panzer Grenadier and naval games, and in the “battle games” in the newest Panzer Grenadier games and books like Broken Axis, Invasion 1944 or Spearhead Division. 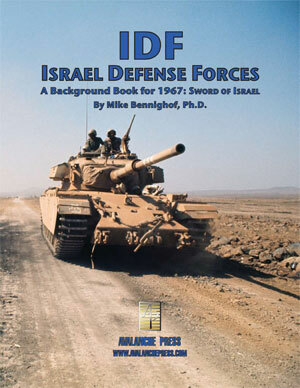 IDF: Israel Defense Forces is a sourcebook for Panzer Grenadier (Modern): 1967 Sword of Israel. It tells the story of the 1967 Six-Day War, in which Israel defeated its Arab neighbors Egypt, Jordan and Syria in just six days (hence the name). Rather than just provide a slender history of the war, the book expands on the story told in the game and illustrates how and why the game does certain things to simulate the events of 1967. The actual performance of the Israeli Defense Forces was even more impressive than the war’s name makes it appear. Jordanian combat engineers began blowing up bridges over the Jordan River at 1 p.m. on 8 June 1967, the war’s fourth day, marking an end to fighting on the West Bank. Egypt accepted a cease-fire two and a half hours later. The Israelis attacked Syria the next morning, and by the following afternoon Norwegian General Odd Bull, chief of the United Nations observers on the Golan Heights, had arranged a cease-fire between Israel and Syria. While the results shocked people around the world, informed observers were not so surprised. The Arab states had a greater population and, on paper, a slight edge in number of troops. They also had a great deal of modern equipment – Soviet-made for the Egyptians and Syrians, British- and American-made for the Jordanians. 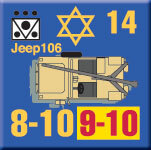 The Israelis did have a technological edge in a few areas (the main armament of many of their tanks, for example) and unlike the Arabs, they made the most of their advantages. More importantly, they boasted a far better-educated population, yielding an excellent base from which to recruit both commissioned and non-commissioned officers, and a people both willing to fight and die for their cause and believing that they faced a battle for their very existence. All of that added up to enormous advantages in the “soft” factors – leadership, morale and initiative. To those the Israelis added training, intelligence and preparation. They knew their enemies: their weapons, tactics and deployment. They had flexible plans to exploit the weaknesses they detected in those deployments, and officers able to modify those plans on the fly. 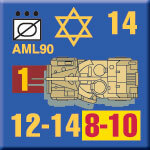 While the Israelis rolled over the Arabs on the operational level, at the tactical level – where our Panzer Grenadier (Modern) scenarios take place – it was not always so easy. Egyptian and Jordanian troops fought hard, particularly from behind fixed fortifications, only to be let down by weak leadership and operational ineptitude. There are many histories of the Six Day War, some of them quite good, others mired in the political axe-grinding that still dominates anything connected to the region. Our book focuses on the military performance of each side, looking at the factors that led to such an overwhelming battlefield victory for Israel and what the Arab states could have done to fight better (in essence, not much in realistic terms – their problems were deep-seated and systemic). 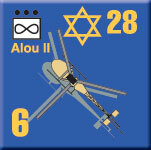 In addition to the historical analysis, IDF: Israel Defense Forces has additional pieces for 1967 Sword of Israel: all 264 of them in an alternative deep-blue-with-gold-markings color scheme. You don’t really need these to play the game – they’re identical to the 264 Israeli pieces found in 1967 Sword of Israel, except for the color scheme. We created the files when 1967 Sword of Israel first came out, with laser-cut pieces. Some that we received had extensive burn marks on them, particularly on the white Israeli pieces. Hundreds of sheets went into our dumpster as unacceptable; a few looked like they had actually caught fire. The supplier claimed they could not cut pieces with a white background without scorching them (though the samples they had given us before we placed the order included white-background pieces). So our production manager created new files with a blue background that would hide the scorching; the Arab armies, fortunately, already had a scorch-camouflaging color scheme. 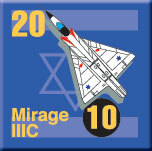 That fiasco now lies well in the company’s tumultuous past, but we still had the Blue Israeli art files and as soon as we announced a reprint of 1967 Sword of Israel with the wonderful die-cut- silky-smooth pieces that have become our standard some hard-core customers began asking if they could have Blue Israelis. IDF: Israel Defense Forces, the book, offered the perfect opportunity to provide these to the dedicated players who want them. The pieces are the best we’ve found in more than 20 years of making games with cardboard pieces: they’re cut using a new technology that requires far less destructive force than old-style die-cutting. That means they don’t have the signature damage to the “back” side of the playing piece (which to the die-cutter is the front side, where the die strikes); both sides are smooth and the cuts are extraordinarily clean thanks to the amazingly sharp steel blades used in the process. We have to include a tiny stripe on the back side of the pieces so players can tell them apart. The pieces are coated with a thin film that gives them their silky finish; they appear to be far more resistant to fingerprints and other marring than the old-style die-cut pieces. And the printing is extremely crisp, to the point where we’ve had to replace a great deal of the artwork in older games reprinted with this process as it shows detail that simply wasn’t visible before. The upshot is: if you’re a geek for game pieces, and if you’ve read this far you know that you are, you have to have these. Don’t wait to put IDF: Israel Defense Forces on your game table! Join the Gold Club and find out how to get it at the Best Price Ever!